Remember the days before mobile phones, texting and Twitter? Remember the days when celebrity gossip was to be lapped up in the pages of weekly magazines, when pop star posters adorned every teenage girl’s bedroom walls and problem pages were devoured for tips on boys, dating and getting rid of spots. ‘Jackie - The Musical’, which is staged at the Alhambra Theatre, Bradford from Tuesday, March 29 to Saturday, April 2, takes the audience on a trip back in time to the 1970s and ‘80s. Jackie Magazine saw millions of girls through their teenage years with fashion tips, quizzes, dating advice, Cathy and Claire’s problem pages - and, of course, pop idol pin-ups. ‘Jackie - The Musical’ revists the heady days and tells the story of a recent divorcee who seeks advice once again from the pages of her old Jackie annuals. The show stars Janet Dibley - a familiar face from ‘The Two of Us’, ‘EastEnders’ and ‘Fat Friends’ - with Nicholas Bailey and Graham Bickley. The soundtrack pulsates with classic 1970s hits from Donny Osmond, David Cassidy and Marc Bolan. 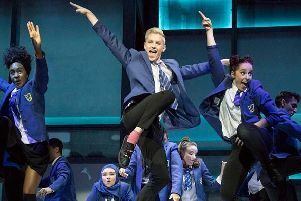 Written by Mike James and directed by Anna Linstrum, with original choreography by Arlene Phillips, the show received its sold-out premiere in Dundee in March and is now on tour. For ticket information tel: 01274 432000.